Take advantage of our PROMOTIONAL PADI Divemaster & PADI IDC Course Combo. 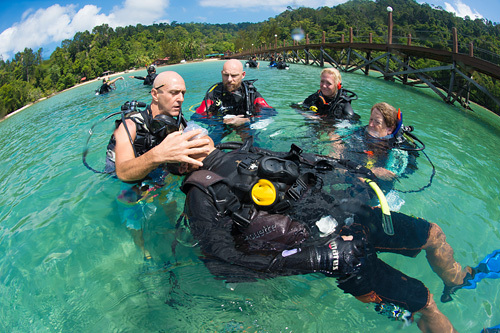 This course includes the full PADI Divemaster & PADI Instructor Development Course plus the Emergency First Response Instructor Course which is a pre-requisite to becoming a PADI Instructor. 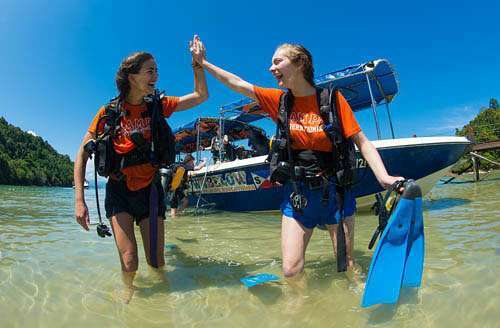 This 30 (thirty) day course program is geared towards the confident PADI Rescue Diver or equivalent who has experience in scuba diving with a minimum of 60 logged scuba dives. We conduct these courses five times per year. 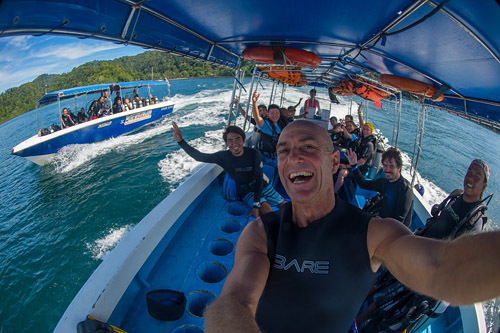 Please choose the start date for your PADI Divemaster & PADI IDC Course Combo Internships are a 30 day duration. The rate above includes a 1 month stay in the dormitory type room with communal bathroom at our Adventure Lodge. Should you prefer a twin sharing room / a private room, please select from the type of room of your choice below. 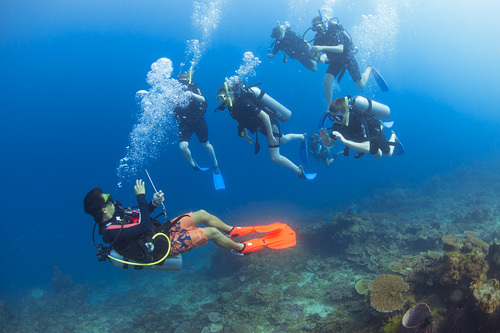 Our PADI Divemaster & PADI Instructor Development Course (IDC) Combo Program is very popular & very successful. 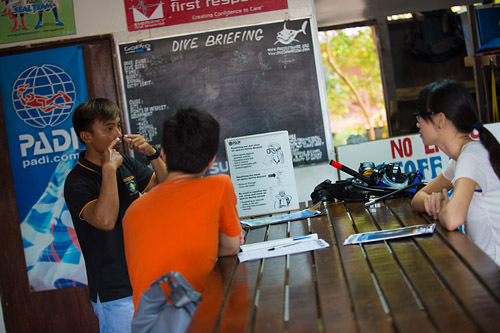 During this course, the PADI system of diver education is introduced by our dedicated Go PRO staff team. The PADI Divemaster course will develop your diving knowledge and leadership skills whilst the PADI IDC provides you with the tools needed during your teaching career to train scuba divers in the classroom, confined water and open water and we will teach and develop your skills in order to use these tools. We have a unique concept in that we offer internship training, which means you pay for the courses ONLY but the diving and time on the island is completely Free Of Charge. This way you can build your experience undergoing supervised practical training in real life situations dealing with real people without it costing you a fortune. You do not have to be on the island everyday but we do encourage you to be involved as you want to gain more experience. Also, we are the ONLY dive center that dives everyday in this area so you will NOT be kept in the diveshop as other operators will do when they don’t have any guests. We offer UNLIMITED diving throughout the program FOR FREE and you dive EVERYDAY if you wish, so gaining the required amount of experience is no problem at all we dive 3 times a day everyday. We also pick you up and drop you off everyday from our lodge. Door to door you will only be 5 minutes from the marina and 8 minutes from Gaya Island & Manukan Island. 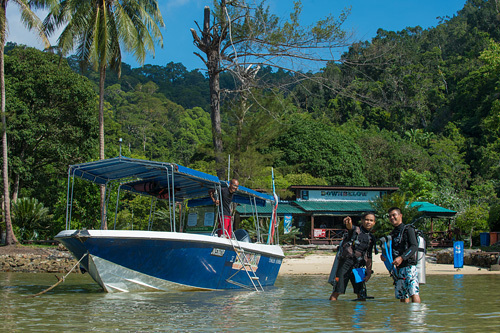 We have 49 dive sites and some fantastic reefs surrounding our PADI 5 Star CDC dive centres within Tunku Abdul Rahman Park where our centre is based, all of them are just a few minutes speedboat ride from where you will be based every day. • Divemaster Manual, Divemaster Slates, PADI Instructor Manual, The Encyclopedia of Recreational Diving, ERDP ML, Log Book, Scuba Tune-Up Workbook, Discover Scuba Diving Instructor Cue Cards, Decal, brochures and other course documentation. • Instructor Application, brochures and course documentation. • Confined & Open Water Instructor Cue Cards, Adventures in Diving Instructor Cue Cards and Rescue Diver Instructor Cue Cards, Divemaster Instructor Cue Cards. • Open water & confined water Lesson Planning Slates. • PADI’s Guide to Teaching Manual and Specialty Course Instructor Manual (Digital, Multilingual version E, DU, F & S). • PADI DVD’s: Positive Approach Selling, Open Water Prescriptive Lesson Guides and Specialty Course Instructor Manual. • Peak Performance Buoyancy Instructor Outline. • Open Water quizzes & exams, Rescue Diver exam, and Divemaster exams. • Emergency First Response Instructor Manual Digital version. • A PADI backpack to carry it all in! • PADI Advanced Open Water Diver (or certified by another diver training organization). • PADI Rescue Diver (or certified by another diver training organization). • Emergency First Response Primary and Secondary Care course (or certified by another first aid and CPR training organization) completed 24 months prior. • Logged a minimum of 60 dives. • Submit a Medical Statement (PDF) signed by a diving physician (12 months prior). • 30 Day Course Program. 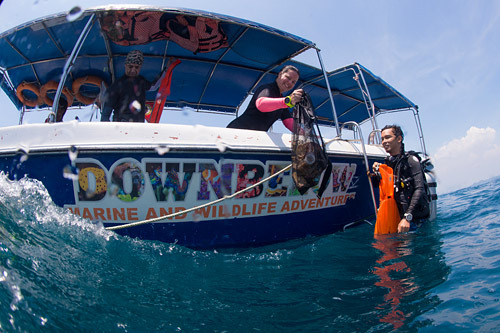 • Unlimited scuba diving from Downbelow’s PADI 5 STAR CDC centres. 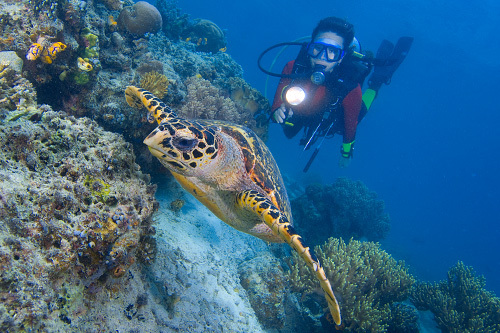 • PADI Divemaster Course (with 1 year membership). • PADI Instructor Development Course. • Emergency First Response Instructor Course. • Emergency Oxygen Provider Instructor Course. 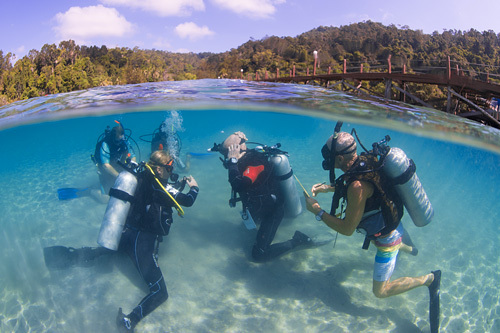 • Internship training – provides a valuable insight into the diving industry by working within our premium PADI 5 Star Instructor Development Centre. 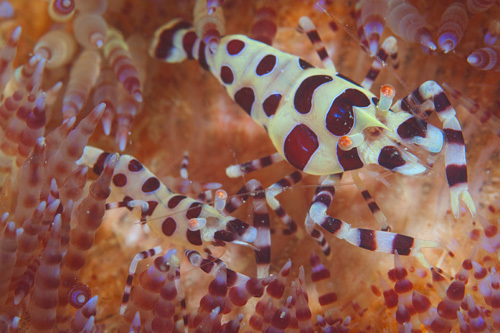 • 1 night dive with underwater torch rental. • All marina and Tunku Abdul Rahman park fees paid. • Logistics – Our Downbelow licensed minivans will pick you up everyday from our Downbelow Adventure Lodge accommodation and bring you to the marina where our speedboat transfers you to Gaya Island. We will bring you back to the Downbelow Lodge at the end of the day. • Free Wifi use at our accommodation, dive shop and classroom at KK Times Square. • Company rate on any travel packages we offer at Downbelow (including the world class diving destinations Sipadan & Kapalai, Lankayan, Layang Layang and our Wildlife Adventure Safaris). • Accommodation – shared air-conditioned dormitory with communal bathroom. 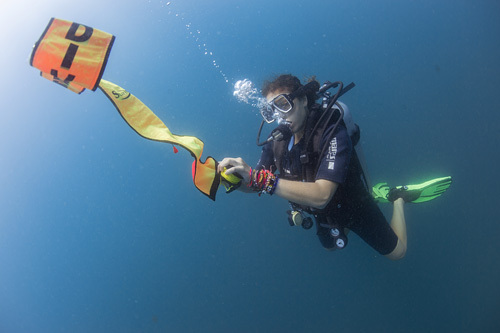 Candidates must own a pocket mask, underwater compass, a surface marker buoy (SMB) and a timing device (watch or dive computer). 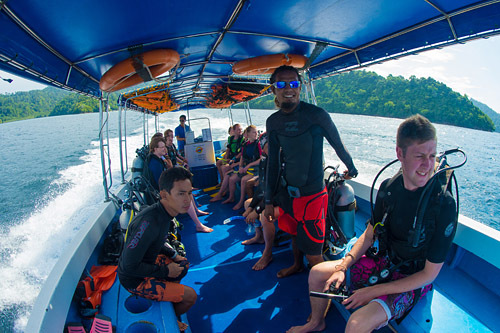 At our KK Times Square Downbelow Dive Shop you will find everything you need and we sell the items mentioned above at a reduced rate for our internship candidates.